Texas Instruments TI-CE84 Graphing Calculator comes with a 320 x 240 pixel, full-color display, 3.5MB of flash memory, and 21 KB of RAM. It offers advanced statistics functions and comes preloaded with more than 30 educational software applications, making it ideal for students. It is also permitted for use on most high school standardized tests, including the SAT and ACT. The USB allows the calculator to connect to other compatible graphing calculators, computers, or projectors for classroom presentations. It comes with a rechargeable battery, eliminating the waste and expense of conventional batteries. The large, 320 x 240 color display makes it easy to distinguish between multiple graphs and plots with color-coded equations, plots and objects. Users can add color to grid lines, making them easier to read. Color-coded connections between equations and visual representations add another layer of understanding for students. Images can even be imported to the calculator and layered under graphs to illustrate real-world applications. The TI-CE84 + Titanium graphing calculator comes with 3.5MB of flash ROM and 21 KB of RAM, offering plenty of storage space for formulas, apps and notes, while providing powerful calculating ability to solve complex equations. 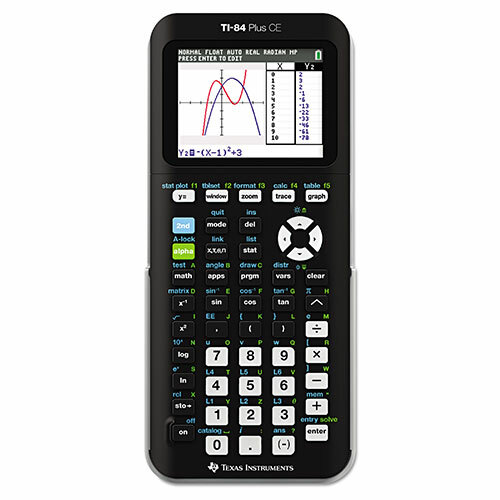 The TI-CE84 + comes preloaded with more than 30 educational apps and learning tools, including App4Math, Vernier EasyDate, and the periodic table, to help students understand the material and succeed. Additional apps are available from Texas Instruments and other developers. The calculator is also approved for use on most high school standardized tests, including SAT, PSAT/NMSQT, ACT, AP, IB, and Praxis exams. A built-in USB port allows the TI-CE84 + to connect to compatible graphing calculators, like another TI-CE84 +, TI-84 plus, and others. It can also connect to computers to download data into spreadsheet programs or compatible software programs for analysis. Texas Instruments TI-CE84 + Color Screen Graphing Calculator, rechargeable battery, USB cable, and user's manual.